We are going to whip right thru these last outfits! Today I am going to style 2 outfits around this super awesome Tulle Skirt from Lulu’s. It’s one of my new favorites! It is getting COLD out!! I’m sure many fashion blogger have horror stories of taking outfit pictures thru the winter. Ugh! I hate it! I am trying to figure out ways to not have to take pictures outside. Sure, it will lead to some less than creative backgrounds but my fingers, toes, noes and whole body will thank me. I still cringe thinking of taking http://www.flickr.com/photos/jenloveskev/4265074756/. I was lucky to be able to take some indoor ones today. I bought this little neon belt at J.Crew. Once I brought it home, I was pretty sure I should return it because it was like $30 bucks. That’s a lot for a stinkin’ belt. Well, for me it was anyways. I debated back and forth and finally decided I would just keep it. I really loved the color. So far it was a good buy because, I wear it all the time. Just like the Tucker blouse yesterday it really adds such a fun pop of color. I love evrything about this look, just amazing! I have the same belt, also almost returned it, and have still been struggling in styling it. I’ve been playing it safe with monochromatic looks, but I LOVE how it looks against the mustard. Thanks for the inspiration! I would never have thought of mixing this skirt with the shirt but I love it! It’s great how blogs can show you outfits you would never have thought of before! LOVE this! you look so good jen. 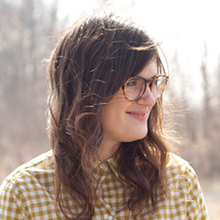 plaids are my fav right now and i’m loving how you where those glasses. keep 30 for 30-ing! Your style is great. I am very envious of the way you put things together. That tulle skirt is adorable. Wow, love, love love this. First, love plaid. Second, love the layered skirt. Love the hat and the belt! Ah, love overload! This is super cool! I love how the neon makes such a splash against the neutrals. I also love your backdrop…your apartment building looks old and unique, awesome! I love this combination. The detailing on your skirt is so pretty. for indoor photos, that is a neat backdrop! and i love the belt!!! J. Crew is so expensive, but so good. They really rock that perfect austerity and have THE best colors. Ever. 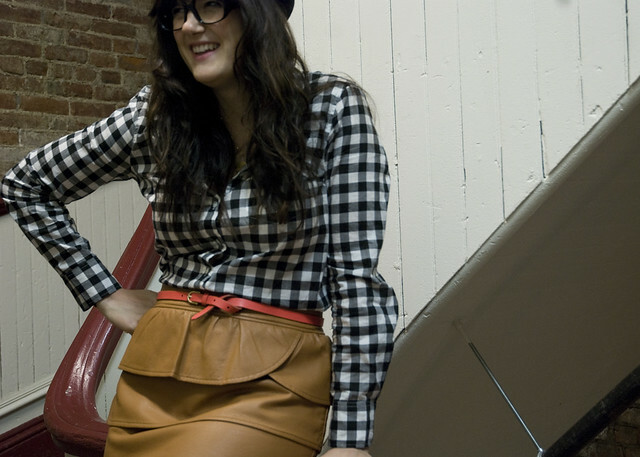 I’m still in love with this skirt… and I love that little bowler hat on you. Adorable. This outfit is perfection. The neon belt looks great with that skirt. And I’m always a fan of gingham. Especially black and white gingham. Awesome.